Four Panels of: 13"x 13"
Dimensions: Four Panels of: 13"x 13"
Staying organized in college is about more than keeping your clothes and dorm desk items organized. You also need to stay organized with your college courses. One of the most important parts to succeeding in college is staying organized. Your college professors won't remind you when your college essays are due and they won't come find you to tell you a paper is late like they may have in high school. When you're in college, you're going to be taking a lot of different courses and some of those may be different courses of the same subject with possibly the same professor. Keep your classes organized with our Peel N Stick 4 Piece Organizer Set! You will need a planner for college, but you may not want to carry around another bulky notebook to every class. With our dorm essential Peel N Stick 4 Piece Organizer Set, you won't have to carry around another college notebook! 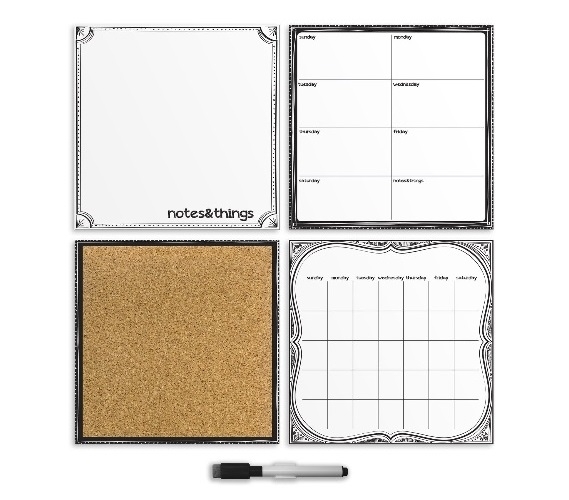 This dorm wall art set includes a corkboard panel with 6 push pins, a message board panel and weekly and monthly planner panel with dry erase marker. With this dorm organizer set you can mark down all upcoming important dates for your college courses and what you need to work on. Unless you're a superhero, there's no way that you will be able to remember all upcoming essays, exams and the important details for each. This handy college supply will help you remember those important details in the most convenient spot- right above your dorm desk!